Happy Thanksgiving! I hope today especially you find a way to take a moment and have a thought of thankfulness. We get so busy moving through our days and forget about any meaning or purpose. So today in honor of this holiday, take a minute and think of what you might be thankful for. 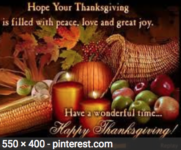 At Micro Plumbing, Inc. we are thankful for a lot of things. One of them is you! From everyone at Micro Plumbing, Inc. Have a Happy Thanksgiving!